Staten Island Chihuahua, Peanut, Declared "Best New York Tail 2005"
In a tough, down-to-the-wire "battle of the boroughs" between dogs, cats and birds, it was Peanut, the long-haired Chihuahua from Staten Island who finally collared the title "Best New York Tail 2005" at the glittering Animal Rescue NY benefit at the famous Cutting Room in New York's Flatiron District on Sept. 28th. Peanut and his owners, Michelle and Andrew Jackowitz, who rushed back from a vacation in Disneyworld just to make it back to the packed-to-the-rafters event, were ecstatic when Bash Dibra, famous celebrity pet star trainer and agent to countless animals in movies and television, boomed "Peanut, welcome to the StarPet Family" from the red-carpet stage, followed by thunderous applause from the audience. They were flanked by Dr. Jill Richardson of Hartz Mountain, a major sponsor of both the contest and the Animal Rescue Event, and Diane West, publisher of New York Tails. The winner was chosen by people from all over New York, the country, and even the world through online votes. Mr. Dibra and Dr. Jill Richardson of the Hartz Mountain Company introduced and congratulated each semifinalist to the standing-room-only crowd. Peanut will now meet one-on-one with the Mr. Dibra, the most famous pet agent on the East Coast, for a personal evaluation and interview. These could very well be the first steps toward a whole new life for Peanut and his family. New York Tails will follow their progress and give you updates. Winners from each borough and county, who were also honored at the event, include Patrice Glenn and her dog Toby from Manhattan, Brenda Walk and her cat, Kaspian, also from Manhattan, Antonia Guerrero and her dog, Flaco, Long Island greyhounds, Shiraz and Buffett, with Sheryl Matthys, basset hound Ringo Starr with Carmen Castro of Queens, and four gorgeous Sun Conure birds (Simone, Hunter, Precious and Sunnae) from Westchester. Special recognition was given to Peggy Cooper and her dog, Mimka of the Bronx, both survivors of domestic abuse and cruelty. Both of these beautiful ladies are living examples of the healing power of the love between pets and people. Each semifinalist will receive a basket of products from the Hartz Mountain Corporation and a beautiful Jazzy Couture bag from Sherpa's Pet Trading Company. The Jazzy line was inspired by New York Post columnist Cindy Adams' beloved Yorkie, Jazzy. 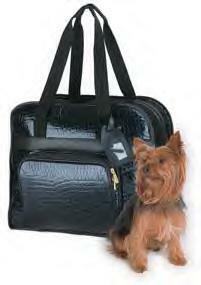 The Jazzy Couture Carrier is the official carrier of the Best New York Tails 2005 contest. Check out the official pet tote of the "Best New York Tails 2005" contestants - the Park Avenue Pet Tote! (Jazzy By Sherpa) Order today by visiting www.sherpapet.com Item Numbers 90144 and 92144. Peggy and Mimka From the Bronx: Mimka, a pigtailed Shih Zhu, and her owner, Peggy Cooper, won the hearts of our judges for their strength and their story. These strong ladies both survived abusive homes and are now a living testimony of hope and healing through the power of the human-animal bond. "I saw Mimka being beaten with a pipe for eating off the street," Ms. Cooper says. "I took her away from those people, having been a domestic abuse survivor myself. Now we love each other madly and help each other every minute of every day in the city." Antonia and Flaco From Brooklyn: Flaco, a handsome black-and-white English Pointer mix, was discovered tied to the platform of Brooklyn's Atlantic Avenue train station. "He was skin and bones when we first got him," owner Antonia Guerrero says, prompting her to give him the Spanish name for "skinny". Skinny no more, Flaco is now a strong, alert, bilingual dog who hablas espanol as well as English. "He's very intelligent, extremely agile, and has a wonderful sense of humor," Ms. Guerrero says, who can often be found with Flaco at Brooklyn's F.I.D.O. events in Prospect Park. Shiraz and Buffett From Long Island: Speedy greyhounds like Shiraz and Buffett couldn't be more fitted for the fast pace of New York, according to owner Sheryl Matthys. Now Shiraz (rescued from the dog track) and companion, Buffett, run just for fun on the beach. Shiraz's speedy thinking may have saved a life, too. "One day at the Madison Square dog run as she noticed a man having a seizure," Ms. Matthys says, "She led me to the bushes to check things out. We called 911 and he was whisked away in an ambulance. Shiraz may have saved a New York life!" Kaspian, originally born in Chicago, was the runt of a kitten litter nobody wanted because of a slight eye defect. Ms. Walk inherited Kaspian from her college roommate. Luckily, Ms. Walk's father is a veterinarian and fixed him right up. Ms. Walk says Kaspian is "the friendliest cat I have ever seen. He's very expressive, meows when he's happy, and loves to sleep in the kitchen and bathroom sinks." Toby, a Bijon/Poodle mix with a mop-top of curly white hair, was found wandering the streets of Brooklyn alone before being brought to a shelter. Ironically, Ms. Glenn met Toby while working on a project with the ultimate cat woman, Eartha Kitt, at the ASPCA. "He's a typical New Yorker," Ms. Glenn says. "He's from the streets, he's got a sense of humor, and he's very intelligent." Ringo Starr From Queens: Ringo Starr, a soulful basset hound, lives with his adoring family in Fresh Meadows, Queens. While he can't play the drums like his famous Beatles namesake, we're told he does try to sing on occasion. "My husband named him Ringo Starr because he said he looks like the real Ringo!" Ms. Castro says, adding that Ringo Starr loves "people, other dogs and attention." Simone, Hunter, Sunnae and Precious From Westchester: While entering the contest may have been a "flight of fancy" at first, it turned out to be the winning ticket for birds, Precious, Hunter, Sunnae and Simone, a quartet of Sun Conures from Yonkers, New York. "Simone, Hunter, Sunnae and Precious have made us a part of their flock," owner Lisa Figiel says. "Not a day goes by without being amazed at what they can do, how they make us laugh, and their outpouring of unconditional love." Would you like to be notified when New York Tails updates its Web site with articles about pets and issues of interest to pet owners and news of next year's Best New York Tail Contest? Click here to send us e-mail. Enter "New York Tails Updates" as the subject of the e-mail.